Maintain focus on the task at hand and stay comfortable throughout the day with this Realspace mesh-seat office chair. 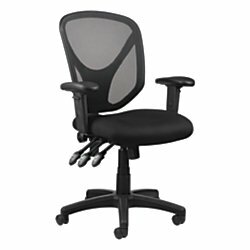 Multiple adjustments allow you to configure the Realspace MFTC 200 mesh office chair to your liking. Contemporary black mesh looks great in any office and facilitates airflow to keep you comfortable in the Realspace multifunction chair. Overall Dimensions: 41 3/4in.H x 26in.W x 25 3/16in.D. Adjustable and lockable tilt for both seat and back to facilitate your productivity. Realspace multifunction ergonomic chair offers 1-touch seat-height adjustment, so you can find the perfect position for your back. Plus, adjustable arm height offers complete customization of this mesh-back office chair, alleviating strain on your arms and shoulders. Meets and/or exceeds ANSI/BIFMA performance standards. Weight capacity tested to support 250 lb. Assembly is required. If you have any questions about this product by TUL, contact us by completing and submitting the form below. If you are looking for a specif part number, please include it with your message.